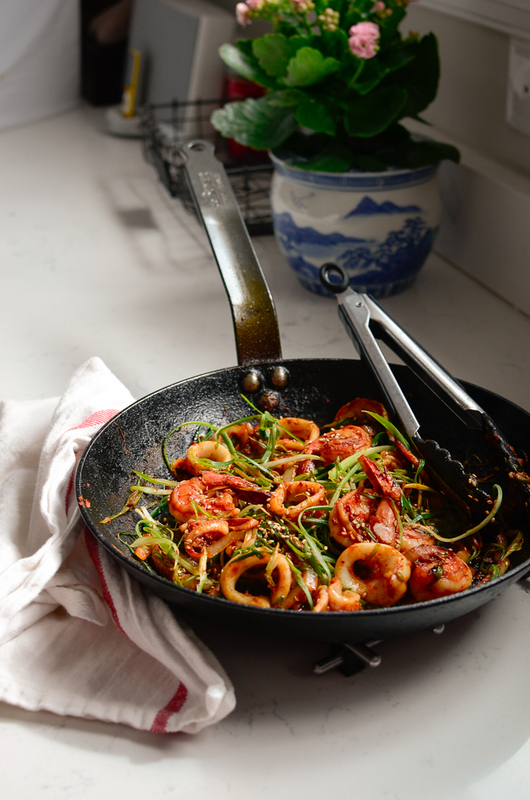 Squid and Shrimp stir-fry with soybean paste? That sounds a little awkward, right? I always wanted to try to cook seafood in different ways. This time I am trying with Korean soybean pasted (doenjang, 된장). The result is actually quite nice. Deep and robust flavor that serves very well with a bowl of rice. I love seafood, no doubt. However I just don’t get to eat them that often because my not-so-seafood-loving families. I decided to cook seafood more often hoping that someday they would fall in love with them. We will see if that will ever happen. 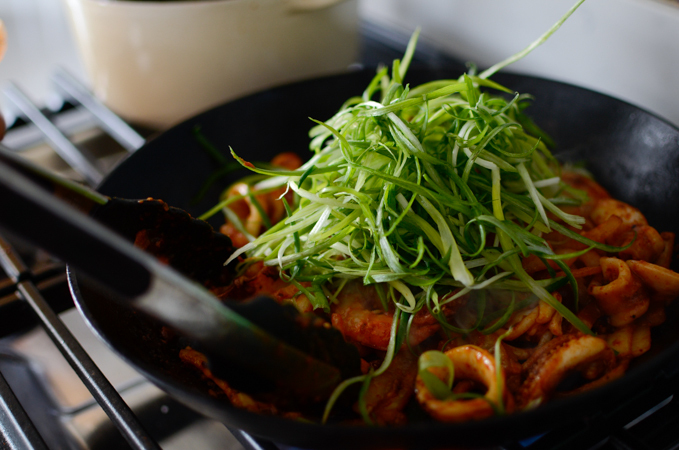 But for now, I am happy with my squid shrimp stir-fry with soybean paste. Easy, quick, and delicious! 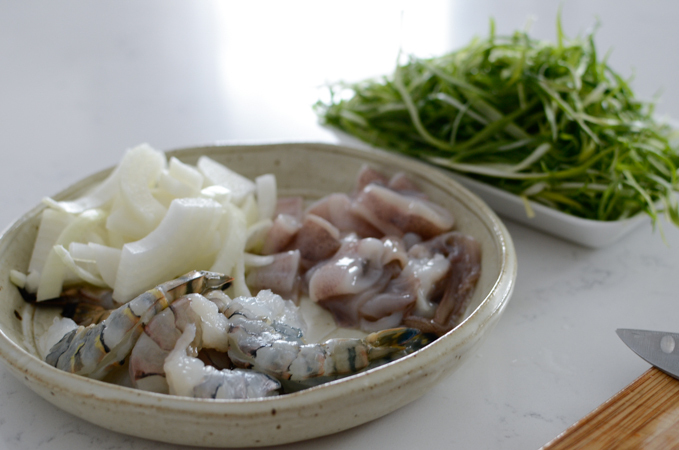 If you like squid and shrimp, you better try this recipe. Clean squid and shrimp and have them ready near by. Cut the onion and a bunch of green onions, too. 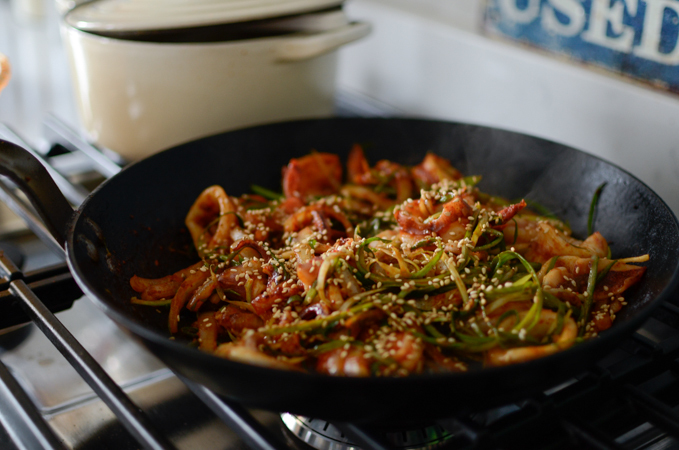 I used shredded green onions that I bought at the Korean stores. You can use a bunch of whole green onion and chop them into any size you like. 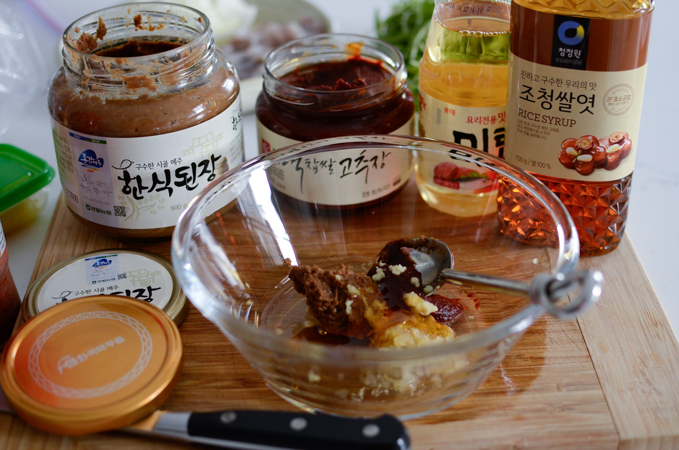 Mix soybean paste(doenjang), a little bit of chili paste(gochujang), garlic, sweet wine(or rice wine), and rice syrup (or corn syrup). 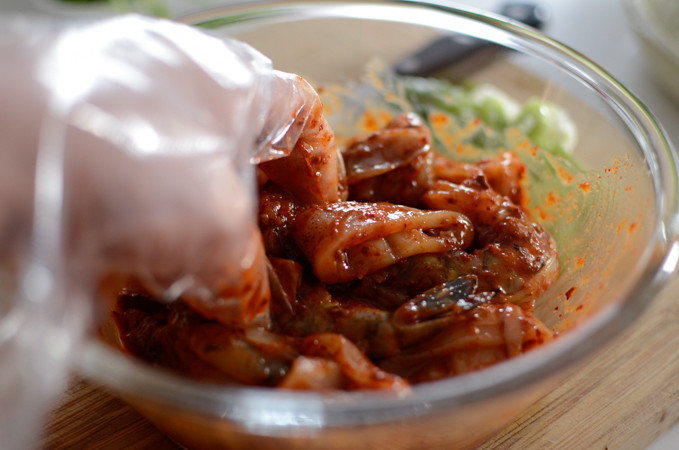 Add the squid and shrimp, and toss well to coat them with the sauce. Stir-fry the onion over high heat until somewhat translucent. Add your seafood friends and stir-fry to cook, about 2 minutes. Add the green onions and continue to stir-fry. I used store bought shredded green onion. You don’t have to search for the shredded version. Just chop a bunch of green onion in any size you want. Finally sprinkle some toasted sesame seeds and they are ready to enter into your mouth. Nice! 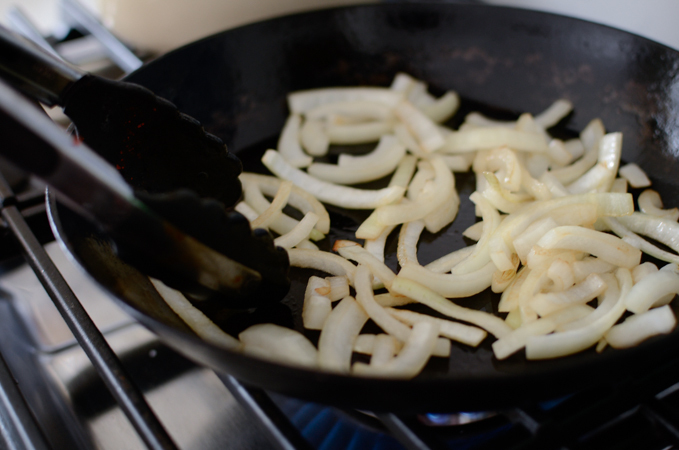 I love their rustic look in my skillet. Bring on the rice! 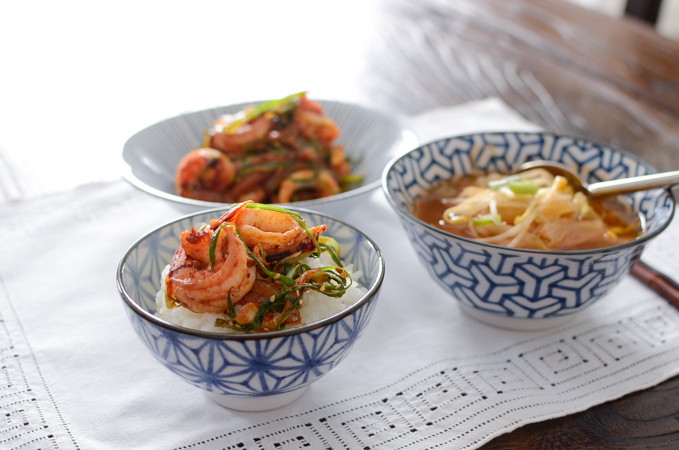 I served with rice and kimchi bean sprout soup on the side. I liked to serve my stir-fries with a simple soup. This is my kind of way of eating the scrumptious meal in a very simple way. 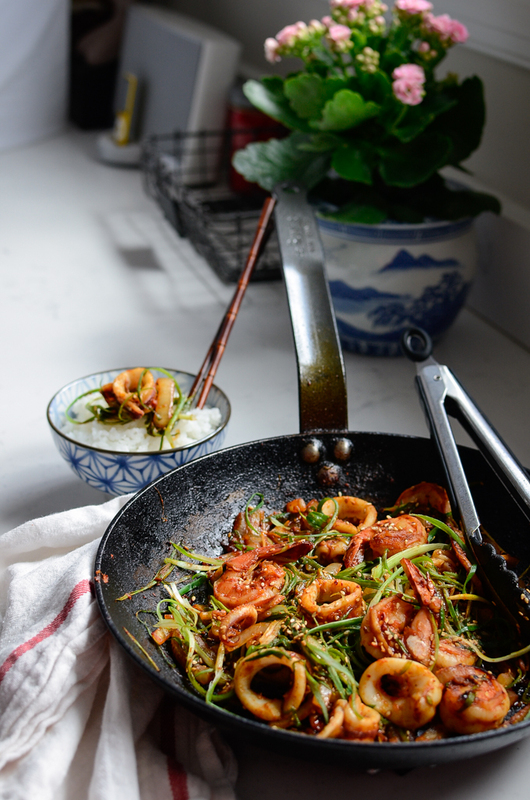 This Squid Shrimp stir-fry with soybean paste will satisfy you, I promise. I literally finished almost the entire pan myself. I know, I am a Miss Piggy. Wait! Mrs. Piggy, I should say. Mix soybean paste, chili paste, chili flakes, garlic, ginger, rice wine, rice syrup (or honey), sesame oil in a mixing bowl. Add the squid and shrimp and toss well to coat. Heat oil in a skillet over med-high heat. Add the onion and saute until soft, about 2-3 minutes. 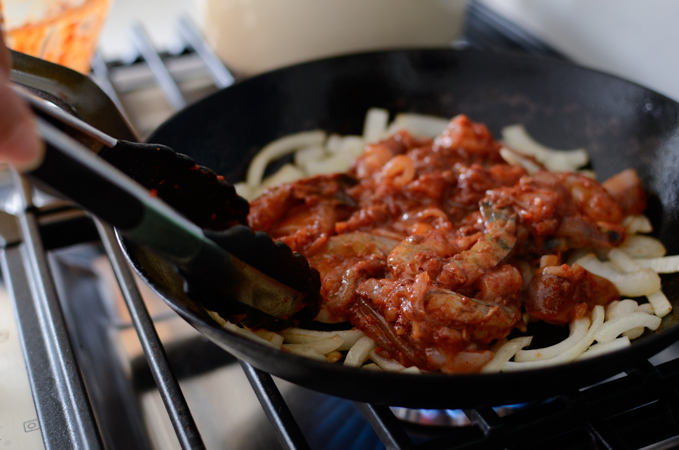 Add the seafood mixture and continue to saute until they are fully cooked, about 2-3 minutes. DO not overcook. Add the green onion and toss quickly. Sprinkle with sesame seeds and serve hot with rice. I do like seafood, so this is just the dish for me. :-) Bet this has lovely flavor -- it sure looks good! Neat recipe -- thanks.